We gotta say, a custom speaker with LED visualization makes for a tidy little package — aside from the satisfaction that comes from building it yourself. Depending on your particular situation, you may even opt to design a speaker that attaches to a magnet implanted in your head. Have you heard about the EspoTek Labrador ? As you will see in the video below, I take a prototype of the EspoTek Labrador for a spin, and try out all of the functions that this board can provide. I use an Arduino UNO, a couple of 433MHz RF modules, some LEDs and a speaker to see just how useful this board will be for my hobby requirements. I have been wanting an Oscilloscope for quite some time, and while this board does not necessarily win against a benchtop oscilloscope on a side-by-side comparison of specifications, it does make up for it somewhat in terms of price, space (or footprint), usability, and wide range of functionality. But does it actually function as an oscilliscope? Is it useful ? Will it do what I need it to do? Or will I still need to buy that expensive oscilloscope that I have been saving up for? Have a look at my review below, and tell me what you think. In my previous post, I showed how to control a few LEDs using an Arduino board and BitVoicer Server. In this post, I am going to make things a little more complicated. It’s time to introduce you to another great tutorial made for Intel Edison. Mimic Monster is a project allowing you to record soundbites and playing them back manipulated. In this step-by-step project, everyone who is interested in audio features and mods , can find useful information on how to manipulate audio files and create amazing effects from your voice. Having landed on Earth, this little alien needs you to teach it how to speak. Speak into its audio antenna and it will repeat your words back. Press a button and change its pitch. In this tutorial, you will learn in more detail, how to work with a USB sound card, a microphone, and a speaker. Before you begin, make sure you’ve followed through Intel® Edison Getting Started guide, and our previous tutorial, the Intel® Edison mini-breakout Getting Started Guide. Check the other tutorials of the series. Morse code used to be widely used around the globe. Before voice transmissions were possible over radio, Morse code was all the rage. Nowadays, it’s been replaced with more sophisticated technologies that allow us to transmit voice, or data much faster and more efficiently. You don’t even need to know Morse code to get an amateur radio license any more. That doesn’t mean that Morse code is dead, though. There are still plenty of hobbyists out there practicing for the fun of it. [Dan] decided to take a shortcut and use some modern technology to make it easier to translate Morse code back into readable text. His project log is a good example of the natural progression we all make when we are learning something new. 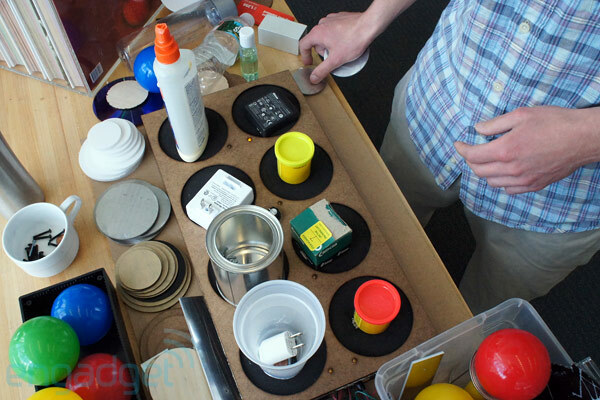 He started out with an Arduino and a simple microphone. He wrote a basic sketch to read the input from the microphone and output the perceived volume over a Serial monitor as a series of asterisks. The more asterisks, the louder the signal. He calibrated the system so that a quiet room would read zero. He found that while this worked, the Arduino was so fast that it detected very short pulses that the human ear could not detect. This would throw off his readings and needed to be smoothed out. If you are familiar with button debouncing then you get the idea. He ended up just averaging a few samples at a time, which worked out nicely. The next iteration of the software added the ability to detect each legitimate beep from the Morse code signal. He cleared away anything too short. The result was a series of long and short chains of asterisks, representing long or short beeps. The third iteration translated these chains into dots and dashes. This version could also detect longer pauses between words to make things more readable. Finally, [Dan] added a sort of lookup table to translate the dots and dashes back into ASCII characters. Now he can rest easy while the Arduino does all of the hard work. If you’re wondering why anyone would want to learn Morse code these days, it’s still a very simple way for humans to communicate long distances without the aid of a computer. Interacting with objects in a new way has always been the main focus of Digital Habits, a design studio based in Milan. Today we are proud to announce they’ve become a partner of the Arduino At Heart program with their new project called Cromatica (it was exhibited at the coveted Fuorisalone Milan Design Week in the Superstudio Temporary Museum for New Design and started the crowdfunding campaign just some days ago!). Cromatica is half speaker and half desk lamp: it can be controlled through a natural gestural interface, touch sensors or remotely via the Cromatica Android and iOS app. 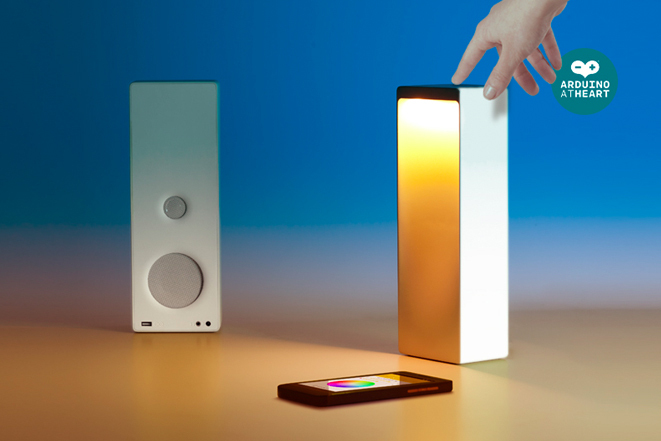 Designed to deliver both light and sound functions, Cromatica features wireless 4.0 Bluetooth connection for streaming music and a RGB lamp for multiple ambient effects. Cromatica is embedded with an Arduino allowing for a highly digital, multi-sensory music and desktop working experience. It blends light and sound functionalities in unexpected ways, taking IoT products to a new level of quality. For example you can download the app for natural awakening: light will rise and music streaming will start allowing you to wake up to your favourite playlist, perfect for early mornings. The Cromatica is also true to its maker roots being Open Source and hackable, opening the doors for endless innovation from the maker community as it can be adapted to integrate with other tech and the Internet of Things. To enable this there will be a special ‘Maker Edition’ campaign reward complete with digital file to 3D print the shell. Take a look at their campaign Crowdrooster and make your pledge! Crowdrooster, the new ‘all tech’ crowdfunding site, introduced Cromatica as the first maker project available for funding on the site. Write an Android app to control an LED light shirt. The app communicates to an ATmega128 via a BlueSMiRF Bluetooth transceiver. The microcontroller outputs data on the SPI to daisy-chained shift-register-controlled constant-current regulators driving RGB LEDs. How I turned my old broken guitar into a speaker. Slow day at work? Want to turn your mouse into a cool practical joke? 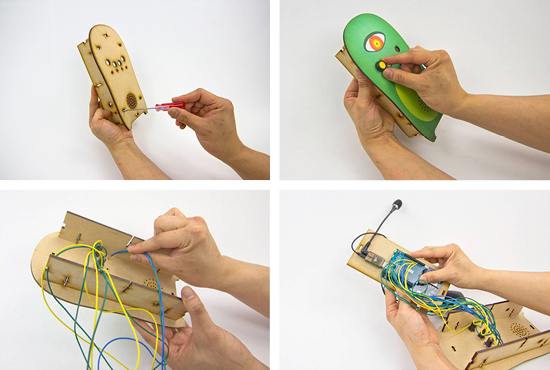 Make this vibrating mouse and have some fun with your co-workers. Recycle wine corks into a functional and stylish cork board.